What are your values? 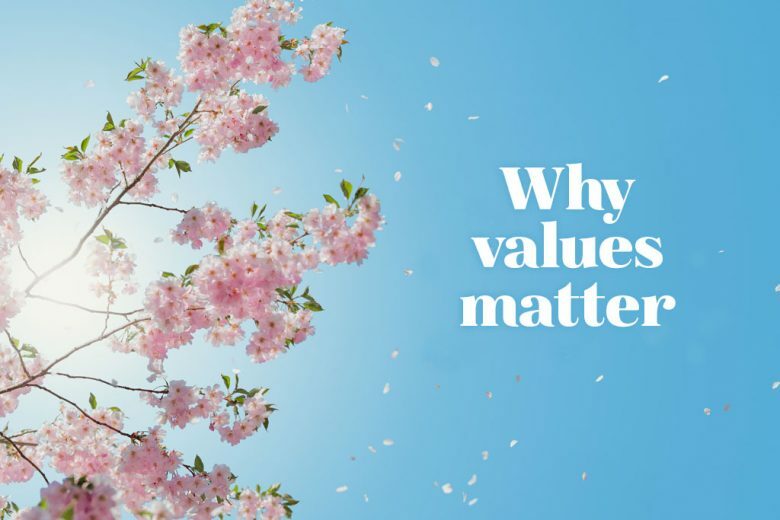 Find out why it’s so important to have values, and how you can work out what yours are. Emma Shute, Founder, Director & Coach with Women to Work, explains why values are so important, and how to work out what yours are. Values are important to us at Women to Work, we talk about them often and we are clear on what they are and how they fit with our business and our personal lives. But it wasn’t always like that, we’ve been on our own journey of value discovery and now we help others with theirs. So what do we mean by values? The dictionary tells us they are “principles or standards of behaviour; one’s judgement of what is important in life”. For me, it’s the ‘stuff’ that matters to us as individuals, what’s important, the key rules we want to live our lives by. When thinking about work for example, working for a cause that really matters to you may be a strong value, or perhaps financial security is what drives you the most. Helping others might be a key value or being able to lead and influence others might be more important. Work-life balance could be at the top of your list right now or having a challenge might be your motivator. It really doesn’t matter what those values are, as each of us will have our own unique set. But having an understanding of your own own values, and looking to build a life that’s true to them can go a long way to achieving a life of fulfilment and happiness. Our values often change, but as many of us don’t normally spend time thinking about them we may not have known what they were in the first place! But it’s not just having children that causes us to question who we are and what we stand for. Our Work Life Discovery Workshop participants have told us that values can change just through getting older, or perhaps after illness or a difficult time at work, maybe your responsibilities are different at home that puts a different emphasis on your time at work. So how do you know what your values are. And why should you even bother to think about it at all? Have you ever had that feeling that something is just not right, but you just can’t put your finger on what it is? I’ve had that feeling a few times, and it was particularly strong right before I decided to leave my corporate senior role in marketing to venture out on my own as a self-employed coach. That sense can often be a nagging gut feeling, but it can take time to figure it out. Fortunately I did, and right now I feel like I’m right where I’m meant to be. My values are being met and I know where I want to go next. But that’s only because I am clear about what my values are, and what is important to me. I am therefore able to measure opportunities against them, and make decisions that enable me to find situations that fulfils them. To help you identify your values, and whether your current work and life situations are meeting them, follow these three simple steps. Start out by making a list of as many things as you can that are important to you in your life – the things that drive you and the things that really matter. To work for an organisation or a cause I believe in. To be continually developing professionally. To work for someone I admire. To have decision making responsibility. To work with a friendly team. To have security and routine. Aim to get a list of about 10. Next, take your 10 and rate them each on a scale of 1-5. The ones that get a 4 or a 5 are your top ones. Take a moment to think about those – do they fit with you? Now you can use these values to measure your satisfaction with your current work or life. To what extent are each of these values being met? If they are not at all, what changes might you be able to make to ensure they are met in some way? Just little tweaks at first to move you closer to working and living in a way that is right for you, a way that allows you to truly live your values. Remember that this is a personal process. So be honest with yourself about what really matters. If having money and a big car are big drivers for you, don’t try to pretend it doesn’t matter – being true to who we are and what you need is vital for this to work. Good luck and enjoy the process of discovering your values! Women to Work supports women’s personal and professional development through coaching and mentoring – direct with individuals or through organisations.